(l-r) Mike Stotz, President of the ITC, veterans and members of IUEC Local 1, and Darrell Roberts, Executive Director of Helmets to Hardhats. More than 400 labor leaders, consultants, workers, members of the military, and other guests recently attended a very special fundraiser in support of “Helmets to Hardhats.” The fundraiser, held in conjunction with the National Building Trades Legislative Conference, raised more than $50,000 in donations. 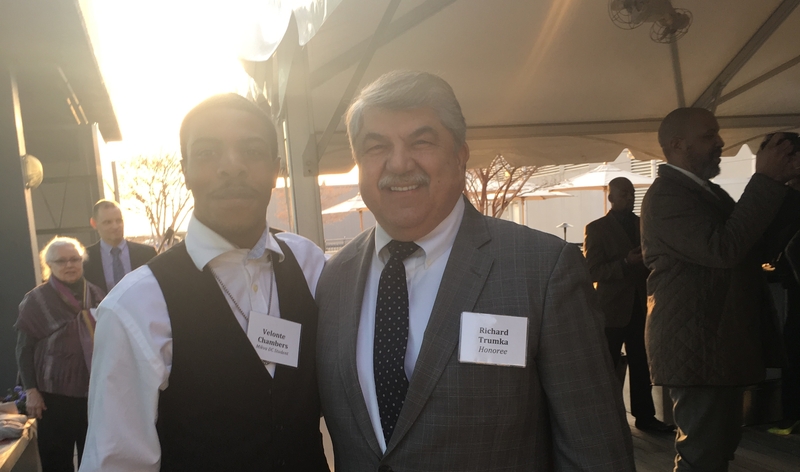 The event was co-hosted by North America’s Building Trades Unions, the AFL-CIO Housing Investment Trust, and the AFL-CIO Investment Trust Corporation. “Helmets to Hardhats” is an extraordinary program that connects retired and transitioning active-duty military service members with skilled training and quality career opportunities in the construction industry. Additionally, “Helmets to Hardhats” also runs a “Wounded Warrior” program, which serves to connect disabled veterans with employment opportunities in the construction industry and the careers that support construction. Speakers at the event included Darrell Roberts, Executive Director of the “Helmets to Hardhats” program, and Michael McCarthy, a member of the International Union of Elevator Constructors Local 1 in New York/New Jersey. Special thanks to PNC Bank, the Bank of Labor, Union Insurance Group, SF&C, Segal Group, Kelly Press, Arnold & Kadjan, Buch Construction, and many more organizations and individuals for making significant contributions to the event. For those who still wish to make a contribution, please let us know by replying to this email. All contributions are tax deductible as provided by law. “Helmets to Hardhats” is administered by the Center for Military Recruitment, Assessment and Veterans Employment (CMRAVE) and is a 501 (c)(3) nonprofit organization. Checks should be made payable to CMRAVE. For more photos from the event, please visit our Flickr.